ROASTED CORN SALSA — Fresh roasted corn, onions, peppers and spices come together in this flavorful salsa! 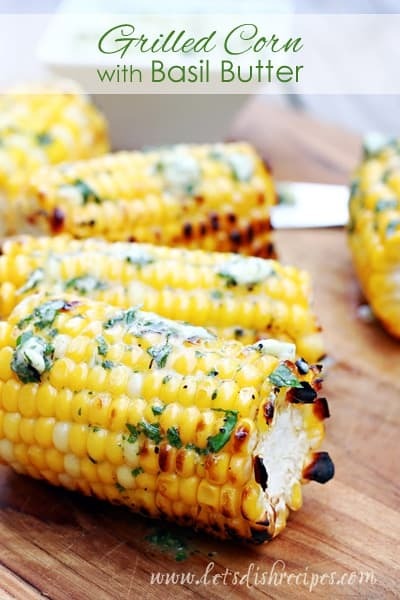 You may have noticed that I’ve posted quite a few grilled corn recipes lately, like Grilled Corn with Basil Butter and Mexican Street Corn. 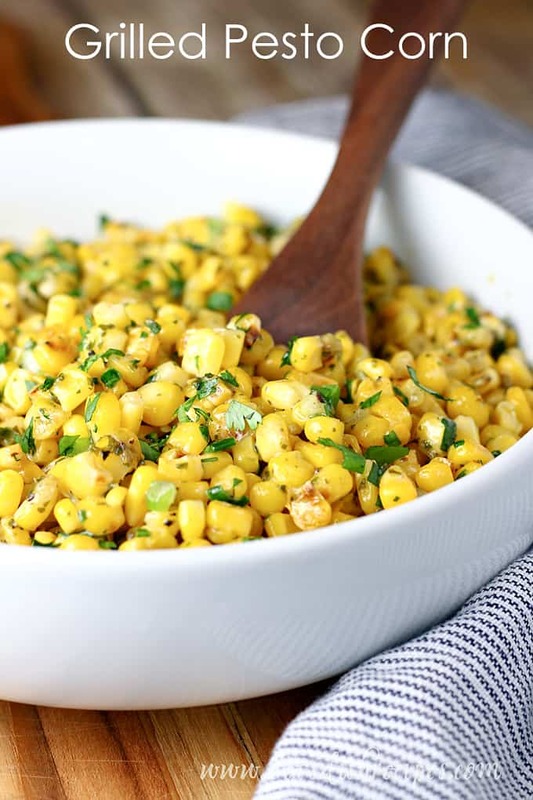 This fresh Roasted Corn Salsa is the latest addition to my collection of corn recipes. About a month ago, my sweet neighbor Cassie took her family to pick corn at a local farm. Let’s just say her kids make quick work of picking corn, so they had plenty to share with the neighborhood. I took 2 dozen ears–they even brought it to me shucked and ready to go! Seriously, how awesome is that? I decided to grill it all up and freeze it to use later–minus the grilled corn I used that very day to make this fabulous grilled corn salsa. I love the combination of flavors in this salsa, especially the contrast of the sweet corn against the spicy peppers. My family was crazy about it too. I opened a bag of tortilla chips so we could all give it a try and my husband nearly finished an entire jar himself in one sitting. 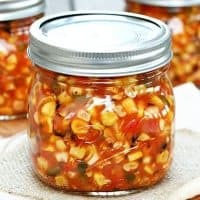 If you find yourself with an abundance of corn this summer, I highly recommend this Roasted Corn Salsa! 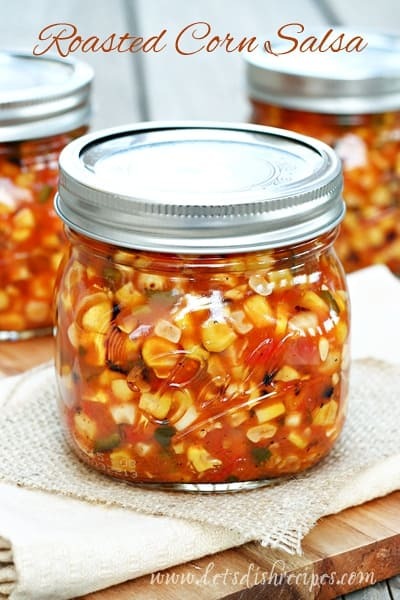 Be sure to save this Roasted Corn Salsa recipe to your favorite Pinterest board for later. 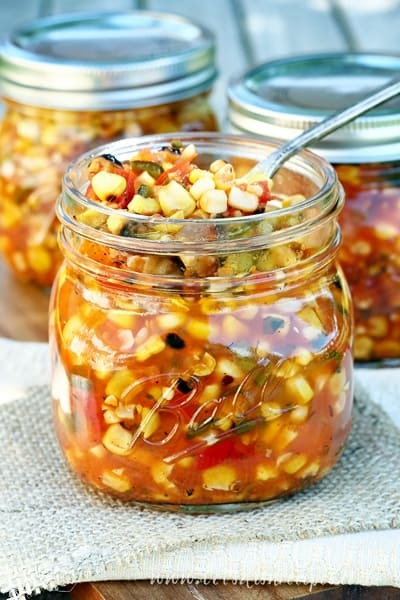 Fresh roasted corn, onions, peppers and spices come together in this flavorful salsa! Preheat broiler. Husk and de-silk the corn. Brush the ears with olive oil and place on a rimmed cookie sheet. Place corn under broiler and roast the corn until the kernels darken, 3-5 minutes. Turn ears and repeat. If you prefer, the roasting can also be done outside on a grill. When the corn is cool enough to handle, cut the kernels from the cobs with a sharp knife. Combine the remaining salsa ingredients,except the cilantro, in a large pot and bring to a boil. Simmer for 10 minutes, until the liquid has reduced. Taste and adjust spices. Add the cilantro and simmer for another minute or two. Cool and ladle into airtight jars. Keep refrigerated for up to one week. Who Dished It Up First: Adapted from Macheesmo, from the Food in Jars cookbook by Marisa McClellan. Oh this looks amazing Danelle- will definitely be doing this one. I love corn salsa. Never thought to make it my self – duh! Your recipe looks delicious! This is my kind of salsa – looks amazing! What is the shelf life of this recipe? Refrigerated or not? 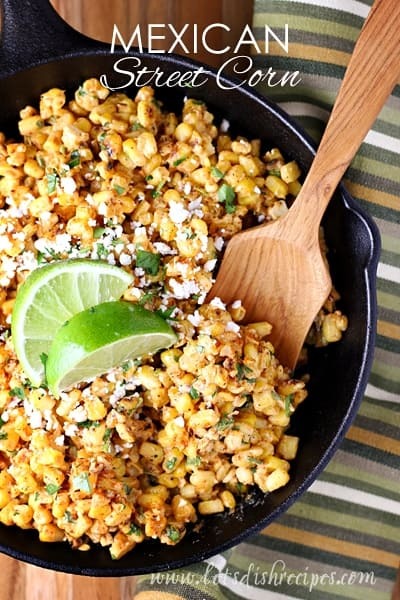 Can you do this with frozen corn and fry it up on a skillet a little bit instead of grilling? And how spicey do the poblanos make it? On a scale from 1-10, I can tolare about 3… This looks delicious, but I don’t want it to be spicey. There is quite a bit of vinegar in this recipe. It should last a few weeks in the refrigerator. Just wondering if you could water bath can this recipe? Yes, I believe the recipe I adapted it from canned it. Check the link to Macheesmo right under the recipe. Way to sweet for us and I only used 1/4 cup of sugar. Wow this looks absolutely delicious. I love corn salsa (at home, but even at places like Chipotle!).. and I love pickling foods. So this is an absolutely perfect combination for my summer meals. Thank you for sharing this recipe! Your pictures are also beautiful. What is the time for canning? When I make this salsa can u not it right then or do u have to cann it for a week? Can you can this recipe…if so…how long do you process it?